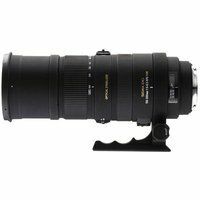 The Sigma 50-500mm f4.5-6.3 DG OS HSM lens is an upgrade to Sigma's popular 50-500mm ultra-telephoto zoom, and now includes an Optical Stabilizer which offers the use of shutter speeds approximately 4 stops slower than would otherwise be possible - a particularly useful addition on a lens of this size. The Sigma 50-500mm OS lens incorporates HSM (Hyper Sonic Motor), to ensure quick and quiet auto-focus, as well as full-time manual focus capability. Four SLD (Special Low Dispersion) glass elements provide excellent correction of colour aberration, while the Super Multi-Layer Coating reduces flare and ghost and ensures high image quality throughout the entire zoom range. The addition of the optional 1.4x EX DG or 2x EX DG APO Tele Converters produce a 70-700mm F6.3-8 or a 100-1000mm F9-12.6 MF zoom lens respectively. The filter size of this lens is 95mm, but the lens is supplied with a step down ring enabling digital cameras with an APS-C size image sensor to use an 86mm filter.